Get that distinguishing look with custom widths. We offer width options from 4″ to 20″ planks. Carlisle’s custom width option gives you the diversity you need to design your ideal wood floor. Whether you desire the uniform look of a single-width plank or the aesthetic of a floor with randomly sized planks, the choice is yours. The right choice for you depends on room style, size, personal tastes and more. See how wider boards compare to mass-produced flooring, commonly available in narrower widths and shorter lengths. Wider boards create fewer seams and a more beautiful design aesthetic. Still unsure about what width or widths work best for your project needs? 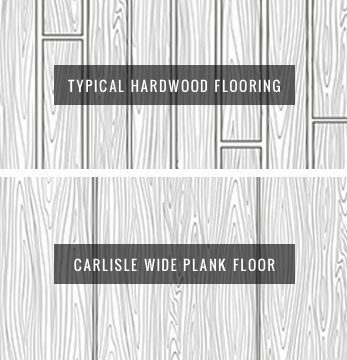 A Carlisle Wide Plank Specialist can walk you through all of your options, showing you examples of each style and helping you select the perfect look for your floor. Learn more about our other custom flooring options.